Many geoscience graduates begin careers as petroleum geoscientists at large exploration and production companies. A typical career path might include 10 years at a major exploration and production company, a few years with an independent company, and eventually a one-person consulting practice. It’s easy to overlook employment possibilities in oilfield services, companies that provide data and address practical problems in hydrocarbon exploration and production (E&P). Yet oilfield service companies are involved in everything from seismic data acquisition at the earliest stages of exploration to enhanced recovery in aging fields. Oilfield activities that initially might seem unrelated to geology, such as well cementing or reservoir monitoring, often draw heavily on the insights and perspectives of geologists. An example is Schlumberger Oilfield Services, where I work. The company operates in more than 100 countries, offers a broad range of services and makes significant research and development investments. Of the approximately 7,000 employees registered in the Schlumberger technical community, more than 1,200 count geoscience as their expertise. Many are involved in reservoir-characterization projects that require significant geological proficiency. Geoscientists at Schlumberger do everything from analyze well logs and seismic data to conduct surface geological mapping. Opportunities exist for graduates with bachelor’s, master’s or Ph.D. degrees. David McCormick, a research geologist at Schlumberger-Doll Research in Ridgefield, Conn., is trying to bridge the resolution gap between seismic and borehole data by quantifying geologic relationships in surface outcrops using high-precision global positioning system (GPS) and optical-surveying instruments. The goal is to make digital geological templates to compare with subsurface data for reservoir modeling. 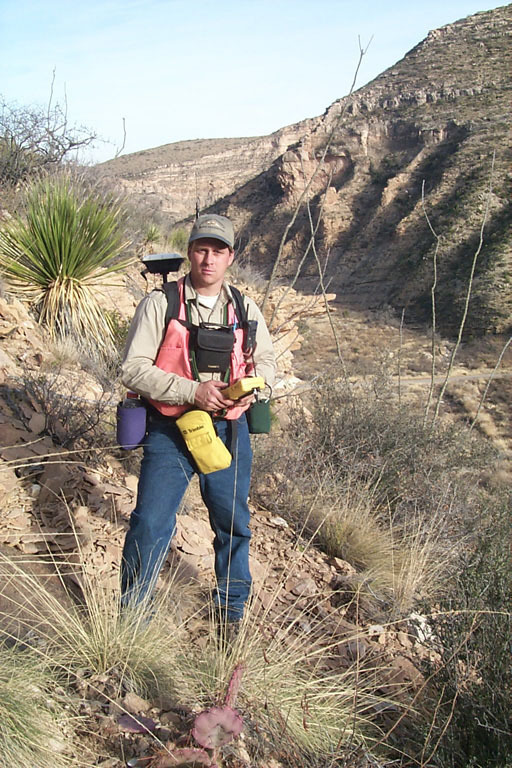 With colleagues from academic groups and Schlumberger customers, he has done field studies in sedimentology and stratigraphy in such varied locales as the shallow marine clastic sediments of the Mesaverde group of Wyoming, Tertiary clastic sediments of Venezuela, and the Late Precambrian carbonate pinnacle of Namibia. Before joining Schlumberger, David earned a doctorate in geology from the Massachusetts Institute of Technology (MIT) and then worked as a research geologist for Chevron Petroleum Technology for five years. Peter Kaufman, David’s research colleague at Schlumberger-Doll Research, has concentrated on mapping faults and fractures, working on outcrops in California, Utah and the United Kingdom. Peter’s field mapping campaign started with learning a new technology: how to use the differential GPS surveying equipment to acquire outcrop data. Peter has been developing ways to visualize outcrop data using VRML and Open Inventor scripts. VRML is a scripting language much like HTML that allows 3-D graphics to be displayed using a Web browser. Open Inventor is similar. Peter assembled a library of scripts to generate these visualizations and wrote a user interface that helps geologists create their own 3-D outcrop visualizations. Previously, Peter worked for Amoco Production Co. after earning his doctorate in geology and geophysics from MIT. Service company careers for geoscientists can follow unexpected paths because of the collaborative, multidisciplinary nature of projects. Tami Chism Rahn, who earned bachelor’s degrees in geology and petroleum engineering at the University of Wyoming, worked as a relief pumper for a small service company in Wyoming and as a reservoir engineer for two major E&P companies before joining Schlumberger. She now uses geostatistical and deterministic tools to map reservoir flow parameters in three dimensions. Tami often evaluates reservoir geology and economics using limited data, integrating her interpretations with those by coworkers from other disciplines. Recently, she moved to Abingdon, England, to join the software commercialization team. Service companies provide integrated interpretation software to many E&P companies. Geoscientists train and support software users, manage corporate databases, and assist in software development, documentation or marketing. Sally Wycislak Bommen, a 1996 geophysical engineering graduate of the Colorado School of Mines, began her career with GeoQuest, part of Schlumberger Oil & Gas Information Solutions, as a petrophysical software support specialist based in Houston. Sally worked for three years in Stavanger, Norway, providing onsite support and training Scandinavian oil companies before returning to Houston in 2001. She is now implementing the knowledge management system developed for Data and Consulting Services. She uses her skills to solve problems in geoscience through collaboration, training and knowledge management. Perhaps the most familiar geoscience role is that of the field engineer — the supervisor of the crew that provides a specific service, such as well logging, seismic surveying or cementing. After a few years in the field, Schlumberger field engineers often move into research, product development, marketing, customer service or other positions. Samantha Rist, who did master’s degree work in geotechnical engineering at Cornell University, began her career with Schlumberger as a field engineer in Casper, Wyo., supervising a wireline logging crew. After four years in the field, she was promoted to the commercial training department of GeoQuest, where she taught GeoFrame interpretation applications to customers. Samantha recently progressed to a position of greater responsibility in knowledge management and interchange, working on an internal help desk that provides technical and operational support to field locations by fostering knowledge exchange between technology centers and operations. Oilfield service companies might not be the first places geoscience graduates think of when mailing their resumes. However, the wealth and diversity of opportunities, significant R&D investments, training and career mobility make service companies excellent places to begin careers in geoscience. Trademarked names used in this article are GeoFrame, StratLog and WellPix (Schlumberger); and Open Inventor (Silicon Graphics Inc.).